The KidCo Door Lever Lock is a unique product designed to keep kids of a specific rooms in your home. 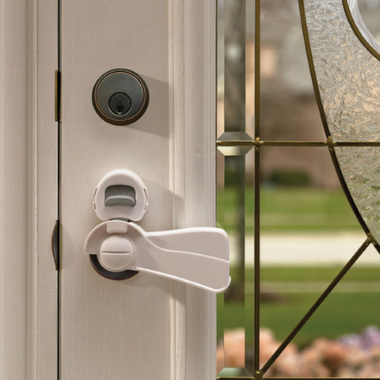 The patented design makes it the only lock that allows entry from the other side of doors. Fits most lever lock styles. The only lever handle lock that allows entry from other side of door! This is the only child lock I could find that works on lever handles and still lets you operate the door from both sides. It is a bit bulky and unattractive, but it gets the job done and our 1.5 year old is not ransacking our bedroom every 5 minutes anymore! We find it simple to operate and like that it re-locks automatically every time you close the door. We do give the door and extra tug to make sure it matches, but that might be because of the over the door hooks we have. Weâ€™ve also found that the latch occasionally gets stuck open, and we just have to turn the handle a couple of times to get it latching again. Overall, a decent buy for peace of mind. We may need to get 1-2 more.